Hi. My name is Kortez Wilson. My first experience working at Tommy’s was as a high school student. I worked at Tommy’s while I attended Cleveland Heights High School from which I graduated in 1997. After graduating from high school, I attended Pennsylvania Culinary School in 1999. My experiences at Tommy’s and culinary school led me to a career as the Executive Chef of Mustard Seed Market Cafe in Solon, Ohio. I also had the experience of being an Assistant Team Leader at Whole Foods Market at Cedar Center. in 2008, I earned my BA in Career Technical Education from Kent State University. 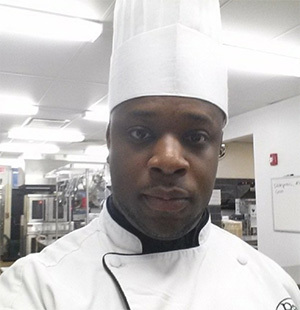 Currently, I am the Culinary Instructor at Beachwood Bistro located within Beachwood High School. I am also back at Tommy’s using my culinary skills to create vegetarian, vegan and gluten sensitive soups and specials. Hi my name is Lisa. I think I have the best job at Tommy’s. I get to make desserts! Although they might not be as healthy as AJ’s cookies and energy bars or Jen’s vegan cookies, I think that they’re good for the soul. I began working for Tommy in June, 1975 as a waitress. About two weeks later I got my sister, Cindy, a job (which turned out to be good job security—Cindy and Tommy got married in 1980). When I started, Tommy’s mom, Inez Fello, made all the specials and desserts. She was an unbelievable cook and her desserts were amazing. People still remember her cherry cheese pie and chocolate cake. 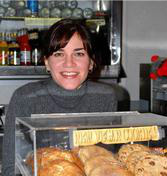 When she could no longer work, Kristen Ban Tepper took over as baker. Although she has many talents, Kristen is best known for her poetry, baking and wicked sense of humor. She tried many different recipes, including cheesecakes and pies, but she was best known for her brownies and carrot cakes (with the cream cheese inside). When Kristen’s schedule became too busy to still work at Tommy’s, I was thrilled to take over the baking. It has been my pleasure to recreate Kristen’s original recipes for brownies and carrot cake. I know better than to mess with perfection. In the early 1990’s I had another great opportunity come along. Oscar Crawford decided to retire. Oscar was a college professor who had developed a recipe for a delicious rum cake called St. Gall Kuchen. He had built up a business selling cakes all over the country at Christmas time. When he outgrew his own kitchen, Oscar began baking his rum cakes at Tommy’s, and we started to sell pieces of kuchen at the restaurant. One year, when Oscar went to Europe for Christmas, Tommy’s took over the baking! Anyway, I began working with Oscar and eventually took over the business. I have done nearly all the baking since, except for a few guest appearances by Oscar (like when my daughter, Mackenna, was born in 1994). I am grateful to have a job that many people would love to have. Hi my name is Jen. I began working at Tommy’s in 1998 after spending many years as a stay-at-home parent. Currently I work evenings and weekends which affords me the ability to home school my kids all week. In the past I have worked in customer service in natural foods stores, as a server in other restaurants, and as a baker for a small coffee shop. Most of my time at Tommy’s is spent as a server, but a small niche has opened up for me as a baker of our vegan cookies. I have been able to come up with a vegan cookie that tastes like a regular cookie but contains no animal products. I make the cookies 16 batches at a time, and they go so quickly it is often hard for me to keep up. I became a vegetarian in 1980, and all anyone ever used to ask me was “what do you eat?” It’s not so strange anymore. Maybe as a society we will move towards using fewer animals and feeding more people. I don’t doubt that a lot of the people who I serve have made a more serious commitment to this end than I have; but, I am proud to even have the smallest part. Thanks to all Tommy’s vegan cookie eaters. Base ingredients for Jen’s Vegan Cookies include wheat flour, salt, baking soda, vanilla, canola oil, rice milk, sugar, molasses, small amount of vegetable shortening.